Make yourself a very Speccy Christmas with Santa Sam Dyer’s ZX Spectrum – A visual compendium – Obi-Wandi, a retrogaming retrographer. Illuminated in a mesmerising green hue of ethereal beauty and presence, a home computer of old comes to life, leaps off a page in Sam Dyer’s latest masterpiece in the exceedingly rewarding “Visual Compendium“-series. Opening the impressive volume emulates perfectly that moment a computer is switched on, with every page impersonating the starkly coloured screen display of the titular ZX Spectrum. 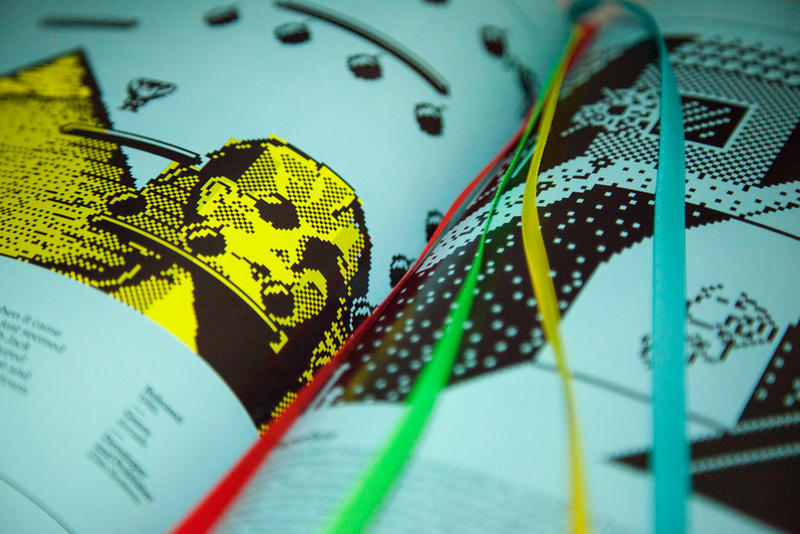 Sam Dyer’s “ZX Spectrum: A Visual Compendium” is a special experience of layered significance. 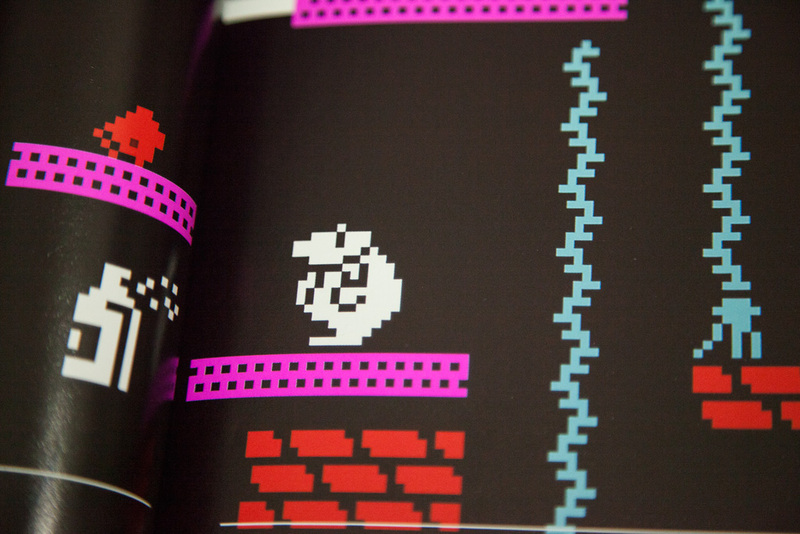 Layers of history, experience, enjoyment, insight and colour are in story for the readers of Bomb Jack and Paperboy in Sam Dyer’s ZX Spectrum: A Visual Compendium from Bitmap Books, available at www.funstock.co.uk. Photo by Andreas Wanda. Enveloped in the beauty of this most elegant volume of computing history are not only the brilliant spreads of retrogaming screenshots and rewarding mini-reviews – of which there are many, each a bearer of prized individual memories – but a treasure trove of computing luminaries and their reflections on a history of a past that, while long gone, seems more relevant than ever. 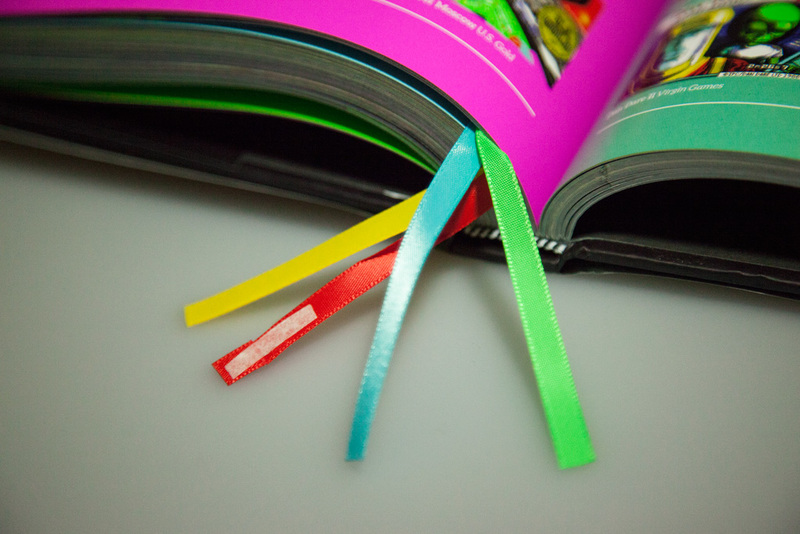 Relevance is etched into every single page of the “ZX Spectrum: A Visual Compendium” from Bitmap Books. Interspersing the plentiful pangs of colourful pixel glory of retrogaming history with choice lessons on industrial design, progamming skills, market analysis and hearty measures of cameraderie and friendship, Sam Dyer and writer Andy Roberts enlighten readers both young and seasoned. From the great Rick Dickinson, who reveals the Bauhaus aesthetics of the legendary Spectrum design, Kevin Toms and his lively “Football Manager” account, artist Nick Bruty’s sleep-deprived memories of the 8-bit era, to Ray Owen’s “Magic Knight” creation, Dawn Drake’s tale of how her eyes came to be “pink and screen-shaped” and several pages dedicated specifically to “Spectrum memories” – featuring the likes of Mev Dinc, Anthony Hewson, Mark R. Jones, Simon Butler and Alberto J. Gonzáles, to mention but a few, readers from all walks of life will find themselves rewarded by the “ZX Spectrum: A Visual Compendium” and subsequently equipped with insights that are instantly applicable to the gratified readers’ everyday environment, be they retrohunters or managers. Monty Mole is one of the key characters of the ZX Spectrum gaming era, pictured here in its colourful glory, from Sam Dyer’s ZX Spectrum: A Visual Compendium. Photo by Andreas Wanda. Bitmap Books’ latest covers the ZX Spectrum throroughly without ever overwhelming the reader. Sam Dyer conceived of the new “visual compendium” as an experience of computing history. The deft application of a structual free-form lends the book a living, breathing center in a bold denial of established fragmentations of historic facts that so often wear out their welcome. It is a lovely touch that while the table of contents does establish chapters, the contents themselves seemingly revolt and, empowered by the plentiful memories and secrets of the ZX Spectrum, company profiles, interviews and loading screens, freely engage in an infectious tag-team of retrogaming and computing history. The research effort must have been tremendous judging by the richness of every single line committed to volume of prestine production values. 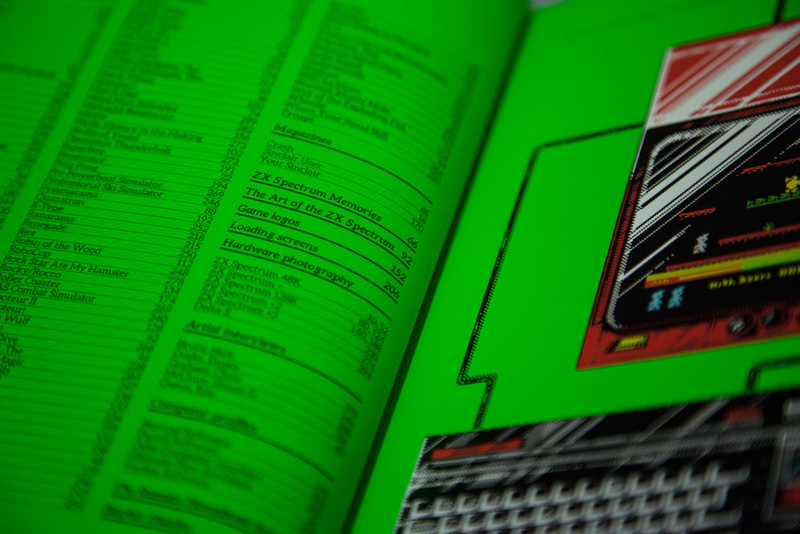 The table of contents dutifully suggests a rigid structure, but the contents rebelliously disagrees and freely intermingles across chapter boundaries to create an engrossing experience of an important era of computing history in Sam Dyer’s ZX Spectrum: A Visual Compendium from Bitmap Books, available at www.funstock.co.uk. Photo by Andreas Wanda. 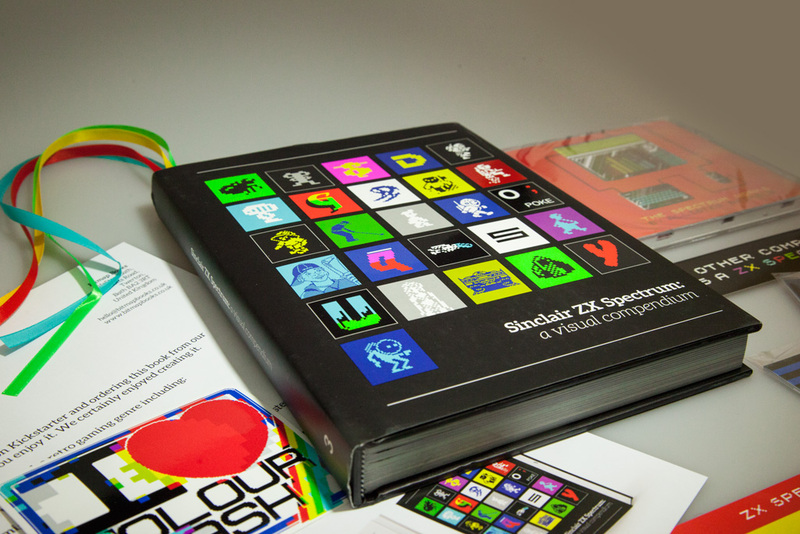 “ZX Spectrum: A Visual Compendium” is a book every owner will by default show off to friends and family. Photographic representations fail utterly to capture the striking effect of the technically highly complex reproduction of the Spectrum’s radiant colour scheme. Sam Dyer seems to make each page glow naturally in defiance of all physical laws, so that owning Bitmap Books’ publication is without a doubt the next best thing to actually operating a ZX Spectrum. Perfect screen display simulation in print: Colours seem to drip from every page of Sam Dyer’s ZX Spectrum: A Visual Compendium from Bitmap Books, available at www.funstock.co.uk. Photo by Andreas Wanda. It goes without saying that every ZX Spectrum owner must have a copy of “ZX Spectrum: A Visual Compendium”. It cannot be emphasised enough, nevertheless, how open-minded Sam Dyer’s and Andy Richardson’s approach to their latest book is. This is not an expert’s book for an in-the-know elite. On the contrary, the Spectrum compendium carefully sets the scene with basic information on the legendary platform beforehand. The reader is not required to be acquainted with the home computing era at all, guided as she or he is by introductory pieces that make one comprehend and appreciate the 8-bit era. Since the technology at the heart of this volume is presented only through the personal experience of individuals, this Spectrum book is instantly accessible, making everyone eager to discover what is about to shine on the next page or spread. Like all human history, the Spectrum’s is one of events, memories, accounts and opinions as preserved in the hearts of people who owned, used and will buy a ZX Spectrum. Writing about Elite Systems‘ “Bomb Jack“, Sam Dyer remembers how this superb arcade conversion was used to “trump your C64-owning mate in the playground”, a scene I literally experienced myself, ever so envious of the ZX Spectrum’s unique capabilities, such as the captivating graphics and the speedier CPU. I have always looked up to “Speccies”. Now I feel like a I did own one: thank you, Sam and your brilliant team, for making a Commodore 64-owner the gift of a computing gem I missed out on. A must buy for a everyone: Sam Dyer’s ZX Spectrum: A Visual Compendium is not simply captivating journey into computing history, it is a recreation of a singular computing experience and social evoluation. Photo by Andreas Wanda.